Geotagging the location of your photos can help you do all kinds of neat things on Flickr and add some great context to your image. With it, you can easily share with others where you went on your recent trip to patagonia, find the best barbecue in Texas, or see a map of your life in photos in Your Map. But with all that great information out there, we also wanted to give you an easier way to control who has access to the location information on your photos in a way that makes sense to you. Today, we’re announcing Geofences, a new feature that will help you to better manage your geo privacy settings on Flickr. Geofences are special locations that deserve their own geo privacy settings. For example, you might want to create a geofence around the your “home” or “school” that only allows “Friends and Family” to see the location of the photos you geotag in that area. So the next time you upload a photo with a geotag in the radius of a geofence, it will follow the default geo privacy you’ve designated for that hotspot. That way, you can easily make sure that only people you trust can see the location of photos taken inside your house or any other sensitive areas while still showing the world exactly where you had those amazing cheese covered duck fat fries. So what are you waiting for? 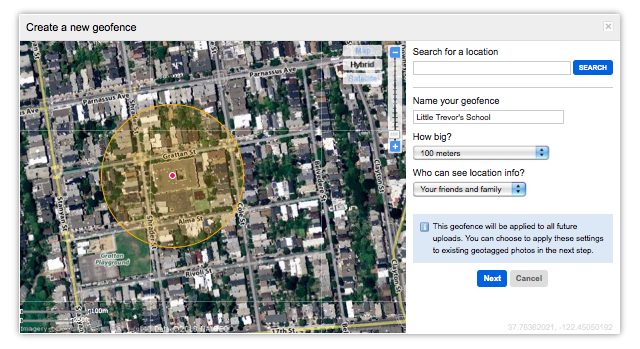 Head over to your geo preferences page to create your geofences and start geotagging! The idea for this feature came from a group of our amazingly talented engineers who came up with this idea over a long weekend. So also check out their post on the code.flickr blog for a behind-the-scenes look at geofences. And as always, if you have comments or find any bugs, just let us know in the forum. Photos from SOMETHiNG MONUMENTAL, SuperDewa, Peonies and Polaroids, Lucy..Williams, JMEllwood, *Nom & Malc, ValerieMorrisonPhotography.com, and _wysiwyg_.